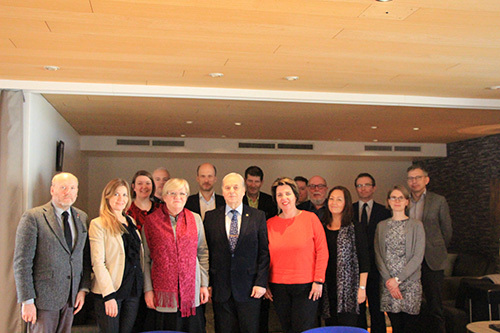 The CPMR Baltic Sea Commission’s (BSC) Transport Working Group, chaired by Kai Holmberg, met with Ms Erja Tikka, Ambassador of Finland for the Baltic Sea Region, on 15-16 February at the Helsinki-Uusimaa Regional Council. Invited as a guest speaker, Ms Erja Tikka presented the Finnish Strategy for the Baltic Sea, outlining what it means in terms of transport and accessibility. The Strategy includes several actions to promote effective transport and logistics to improve competitiveness for Finland. Ambassador Tikka explained: “A lot of the goals of the Strategy are to be implemented at local and regional level. Regions have had a strong involvement in the design of the Strategy”. During the meeting, members of the Transport Working Group discussed the Work Plan, which includes the revision of the Connecting Europe Facility (CEF) and the TEN-T Corridors, support for State Aid for regional airports and the enhancement of connections with third countries. This was followed by an update on several EU projects in which the Transport Working Group is involved in, such as TenTacle, Scandria2Act and NSB Core. Participants also discussed current work related to Transport. For example, the Helsinki-Uusimaa Regional Council presented the results of a feasibility study of the Helsinki-Tallinn railway tunnel project, which is part of the Finnish Strategy for the Baltic Sea Region. During the second day of the meeting, the company, Finavia, presented the development strategy of the Helsinki Airport which held a key location at the node of intercontinental air routes. Working group members shared the experiences of aviation in their regions. The Baltic Sea Commission Transport Working Group will hold its forthcoming meeting, along with the North Sea Commission Transport Working Group, on 5-6 April in Stockholm. The Baltic Sea Commission actively contributes to the reflections of the CPMR and to the preparation of its policy positions, whilst at the same time acting as a think tank and as a lobby for the regions around the Baltic Sea.